In the edition for Microsoft Excel, you can copy a crosstab or chart that is currently displayed in the workbook. In the edition for Microsoft PowerPoint, you can then insert the copied object. Also it seems to me this was possible and easy to do with the "create slide" button in earlier versions of AO. Is there any way to achieve this now? 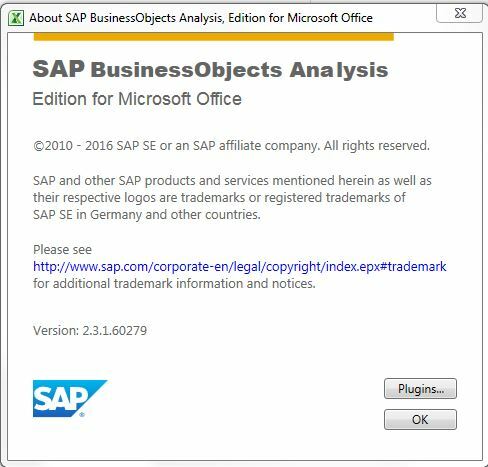 Which version of Analysis Office are you using? There should be a "Smart Copy" which is part of the Tools ribbon. This still works in the latest versions. When I select a chart in excel, the Smart Copy button is grayed out, probably meaning a chart cannot be "smart copied". The question is then, is there any possibility to transfer an excel chart into powerpoint now that we don't have the "Create Slide" button? Can you upgrade to 2.4? Not sure which SP we are on... is 2.3.1.60279 SP3? Probably not. Will try to make sure I am on SP3 to see if that fixes this bug (I'm assuming this is a bug since it is not working as described in the F1 help of the AO add-in).